Mazda giveth with one hand, and taketh with the other. We've always liked the Mazda6, but it was a bit down on power with just 184 hp from a 2.5-liter four-cylinder. Despite our pleas for a turbocharged variant, Mazda continued to shoot itself in the foot on power, until now that is. At this year's LA Auto Show, Mazda revealed the 2019 Mazda6, which is now available with a 2.5-liter turbo four-cylinder with 265 hp and 310 lb-ft of torque. This is the power boost that we have always begged for, but there is a catch. 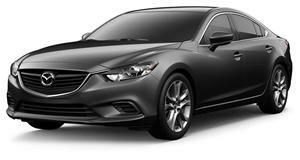 The base engine Mazda6 is available with a six-speed manual transmission, but the turbo is auto only. In an interview with Autoblog, Mazda engineers Jay Chen and Yoshiaki Yamane talked about why the company won't offer a manual on the turbo engine. Apparently, Mazda was targeting smooth and gradual torque delivery that didn't pair well with a manual. Mazda's current manual transmission, which was built to handle the torque of the European diesel engine, just couldn't handle the massive torque of this new turbo engine. In fact, this new Mazda6 has one of the highest torque figure of any FWD car on sale today. In order to prevent torque steer, Mazda made numerous changes to the suspension and steering, as well as the torque delivery. Mazda was targeting a more sophisticated driving experience rather than a sporty one. Much to our disappointment, this turbocharged Mazda6 is not meant to be a replacement for the forgotten MazdaSpeed 6. Mazda refuses to bring back its MazdaSpeed cars as it targets a more mature audience. We will continue to lament the lack of sporty Mazda models, but are pleased that the Mazda6 finally has the power that it has always deserved. Interestingly Mazda still doesn't offer AWD on the Mazda6, but it could happen if enough people express interest.